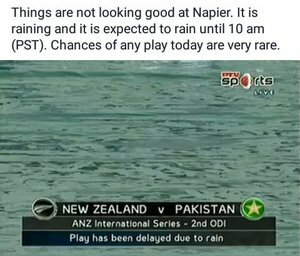 UPDATE: Match delayed - rain 2nd ODI: New Zealand v Pakistan at Napier - Jan 28, 2016 #PAKvsNZ #NZvPAK "
i: PCB confirms Mohammad Amir has been passed fit for the 2nd ODI & Shoaib Malik's fitness to he assessed shortly before the match #NZvPAK ""
New Zealand Cricket apologises for Amir cash register sound. 40 mins away from umpires inspection but forecast is not good enough..
30 minutes away from the scheduled inspection. 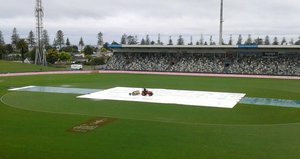 It's still raining in McLean Park, Napier! 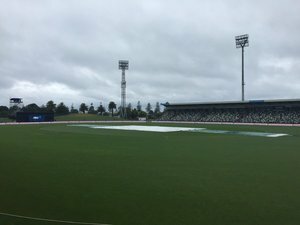 rain in Napier delays toss. New Zealand lead series 1-0. Guptill has been removed by Mohammad Irfan 4 times in 6 ODI meetings; only Nuwan Kulasekara (8) has dismissed him more often.